Finally a Wireless Range Extender which is as nice as cheap and easy to configure! My wifi router is on the first floor and wifi connections from both the ground floor and the second floor are really poor due to the large concrete slab between each floor. So, I decided to give a try to the nice and discrete TL-WA850RE sold for 38€. The connection with my Buffalo WZR-HP-G300NH was straightforward and went seamlessly. 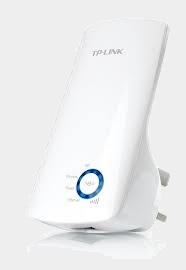 On a laptop, open the pane to select a Wifi Network and pick the "TP-LINK_Extender_xxxxxx network"
Start a browser and navigate to "http://tplinkextender.net". It's the url of the embedded administration website. Follow the wizard to configure the TP-LINK Range Extender as described in the Quick Installation Guide. PAY ATTENTION: you have to disable your popup blocker or allow that website. Otherwise, the final status windows will be blocked and the process won't complete. Once the wizard completed, go to the router configuration website and look for the IP assigned to the TP-Link device (on the WOL page of my Buffalo, I found it's IP for the hostname = *). The best would be to assign a fix IP to the TP-Link's Mac Address! Restart a Browser and navigate to the TP-Link's IP address. Back to the TP-Link administration website, change the default username/password via System Tools > Password. Now, the device can be unplugged and moved into a electrical outlet of a room where the wifi signal is currently poor. There is a DHCP server embedded in the device as well as some other basic wireless features (relate to security, statistics...) that I won't use as far as everything is managed by/on my Buffalo. 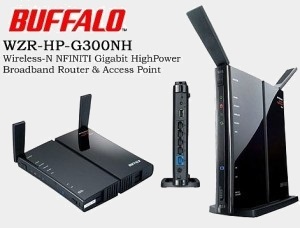 I have upgraded the firmware of my Buffalo WZR-HP-G300NH (v1) with the latest version of dd-wrt... seamlessly ! My Buffalo bought end of 2010 was pre-installed with a version of dd-wrt (a.k.a the "Pro" firmware of Buffalo which was installed by default as of the second half of 2010 instead of their 'friendly' firmware). In the dd-wrt router database, I have searched for WZR-HP-G300H and found it was supported by v24-preSP2. I went to the file server where dd-wrt firmwares v24-preSP2 are available. On that file server, I went to the more recent sub-folder (/2013/02-11-2013-r20675) and looked for the folder "buffalo_wzr-hp-g300nh" and fetched the firmware "wzr-hp-g300nh-dd-wrt-webupgrade-MULTI.bin" (The other one "buffalo_to_ddwrt_webflash-MULTI.bin" is to upgrade from the Buffalo 'Friendly' firmware - which used to be installed by default before the second half of 2010). Using my laptop connected via wifi, I went to the "firmware update" page of my Buffalo, via its web interface menu "Administration > Firmware Upgrade". I chose "don't reset" after flashing, selected the firmware downloaded previously on my laptop and clicked "Upgrade". It took quite a few minutes. Next, the countdown being completed, I have refreshed my browser and the new interface appeared. The previous one was red with "Buffalo" displayed on top. The new one is mainly black/blue and yellow without Buffalo displayed anymore. The Buffalo IP address, which was a custom one, didn't change. The Port Forwarding where still configured in NAT/QoS > Port Forwarding. The wol addresses where still available in Administration > Wol. The Static Leases of the DHCP Server where still configured in Services > Services. I have just received the "Raspberry Pi Model B" I ordered two weeks ago on "RS Components" website. It rocks !!! Licenses can also be bought here to play back MPEG2 or VC1. There are 2 USB slots that I use for a keyboard and a mouse. That can be expanded with a USB hub (There is only one USB port on the Model A). A USB HDD can be plugged to add extra storage if required. Overall real world performance is something like a 300MHz Pentium 2 with great graphic performances. As mentioned, I decided to install RaspBmc. It's really straightforward. Format the SD card, e.g. using a tools dedicated to SD/SDHC/SDXC like "SD Formatter". Download the raspbmc installer here and "run As Administrator" the setup.exe . It will automatically download an image and copy it to the SD card. Plug next the SD card in the Raspberry Pi, plug the HDMI cable on the TV (I didn't test the RCA/Audio output), plug an Ethernet cable and plug the power supply. 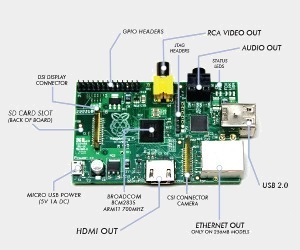 Select the right HDMI input on your TV and you should see the Raspberry PI display. It will configure itself (get an IP address from DHCP server, download the latest release/updates, etc...) and after about 20 minutes, it should start XBMC. In XBMC, go to the main menu > System > Lower submenu > System info and take note for your URL. You can also get there the MAC Address if you prefer like me to configure your DHCP server to assign a fix IP to the Raspberry PI (recommended to remote control XBMC or configure NFS access to Synology - reboot required). On your PC, run a Browser and type the IP address of the Raspberry PI to get access to the XBMC web control UI (on the port 80 configured by default in Raspbmc). It can be used to remote control XBMC. The default username is "pi" and the default password is "raspberry", but for some reasons, adding such a user on the Synology with adhoc rights on the shares does not grant raspbmc access on those ?! On XBMC, add video, music and photo sources. I am not using "uPnP" as it does not support use of metadata stored next to the media files. Instead I am currently using smb. On XBMC, you can go to the menu "Programs" to get access to the RaspBmc settings. The Android Remote Control for XBMC works really fine, as well as controlling XBMC with the TV Remote, which makes this HTPC from far the greatest for that price: ~35€! WOL does not work because the lack for "power management" on Raspberry Pi. The only other way to "power on" the device remotely is to plug its power cable into a USB port on the TV (USB voltage is standardized at 5.0v, so you only have to check the max A supported by your TV). When you turn on the TV the pi powers on too. However, the Pi draws less power when turned on then many Tvs do when off, so there is really no reason to ever turn it off. Turning it off would not significantly reduce power consumption unless it is also unplugged. So, don't ever use the "Power Off" button of XBMC. The only way to restart the Raspberry Pi would be to unplug and plug back in the power supply. Power over Ethernet (PoE) is not yet supported. Maybe in a future version of the Raspberry Pi. In XBMC, go to the main menu > System > Lower submenu > Settings > Apparence > Region. Set e.g. the "Langue of the interface" or your language as "Preferred Language for audio" although you like to watch the movies in O.V. In XBMC, go to the main menu > System > Lower submenu > Settings > Services > SMB Client. Change the name of the Workgroup to match your. Login on the Raspberry Pi via SSH (using Putty, username "pi", password "raspberry". Note: "root" user is disabled by default on RaspBmc) and Raspbmc will prompt you to choose your keyboard layout (Find yours in this list) - use the space bar to select a layout and Tab to move the cursor onto the Ok button. On the next screen, set your layout as the default one and wait until it's "generated" (can be a long process). Continue the configuration with the selection of your region and country. Type "exit" to close the SSH session. Raspbmc overclocks the Raspberry Pi to a safe clock frequency (from the default 700MHz to 800Mhz). Notice that a change of the clock frequency does not blow the OTP (Over Temperature Protection). It is overvolting that does this. Overclocking is therefore not making the warranty void while overvolting will permanently set a bit which invalidates the warranty. Overvolting will also reduce the lifespan. And here are more details on possible values for the overclocking/overvolting. With RaspBmc, there is no need to manually update the firmware (via SSH). This is done automatically by RaspBmc, insuring that the kernel is fully compatible. 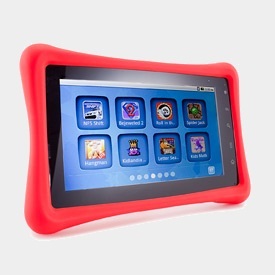 I have just bought a Nabi 2, a tablet for kids which costed me only 155€ (+ 12€ for delivery from Ireland to Belgium) although it's a quad-core 1.3GHz Nvidia Tegra 3 processor and 7-inch 1024-by-600-pixel Capacitive Multi-Touch display running Android 4.0. The Nabi 2 is really great and fast. It connects to 802.11b/g/n Wi-Fi networks on the 2.4GHz frequency. It comes with Bluetooth 3.0 integrated (useful to connect with wireless headphones). It has a microSD slot to increase capacity (support 64GB microSD without issues). It has a mini HDMI out for playing videos on an HDTVs at up to 1080p. The battery can last up to 7h30 while running a video with screen brightness set to maximum and Wi-Fi switched on. It has a 2-megapixel front-facing camera above the screen. It has a proprietary Monarch OS UI. It's built by a Los Angeles-area startup called Fuhu. You will find plenty of reviews on the web looking for "Fuhu Nabi 2". Unfortunately, it does not come with Google Play and generally speaking, Google Apps ("gapps") may not be installed. This was really an hold-back for me as I have already a lot of paid softwares bought on Google Play for my Android phone that I wanted to reused them on that tablet. Fortunately, a known "exploit" of Android has been used to root the device and add all the Google Apps as explained on XDA-developers forum. How to root the Nabi 2 is really best explained here (EDIT: see at the bottom for another improved package containing the "gapps"). Each manual steps are detailed here. It's really clear and did work quite well for me.. Quite well because it appeared that at the step where I had to select the gapps.zip file and install it, this one was not available... I think that the problem that I didn't have a microSD card in the slot... I would recommend to have one plugged before rooting the device... What I did to solve that issue: I copied the file manually from my PC on a microSD card, I did plug the card in the device and I used the "Mount" menu of TWRP to make the SD card acessible from TWRP. Finally, I could select gapps.zip on the external SD. A last fright however. After the installation of the Google Apps (when TWRP says "Installation Complete!") and before clicking "Reboot System" in the lower right, I noticed error messages in the logs: failed to mount \data.. Gasp !! I did try to mount it manually without success. As I still didn't find a solution after one hour spent googling, I decided to reboot the device and pry.... And fortunately, although it took a few minutes to restart and complete the update, everything appeared to be running really fine ! While the nabi is turn on, press the "Power off" button for a few seconds to get the “shutdown” prompt. Press next the "Volume +" and the "Power Off" buttons together for a few second to get the boot menu. You should see soon the following entries in the top left corner, is small fonts. Select Install and browse to find the "gapps.zip" file. IMPORTANT NOTICE. If like me you have the UK version (NABI2-NV7A-UK) don't try to install more recent TWRP like the 2.3.3.0 or 2.4.4.0. They have a bug with the touch screen calibration. you won't be able to touch and select menu/items/etc... anymore in TWRP Really a nightmare. So stick to TWRP 2.2.2.1. Power it on (Press the "Power" button for 5 seconds). Verify that "USB Debugging" is enabled in Settings > System\Developer Options. Check also that you have at least the version 1.9.23 in Settings > System\About. To update the nabi 2, go to Settings > System\ About, Update and click the "Check update" button. On the PC: Go to Control Panel, Device Manager and look for the Nabi tablet device. If it has an exclamation mark next to it, install the PDANet software to get the required drivers. The Nabi 2 should next be properly listed. Press any key in the dos command prompt to continue. The TWRP will be copied on the nabi 2. Press finally the "Volume +" button to confirm the selection. The whole menu appears next much brighter and a few long seconds later you enter the TWRP UI. In the dos command prompt, press any key to continue. The gapps.zip and root.zip files will be uploaded and the device will reboot and reenter TWRP. After the installation press "Wipe Cache/Dalvik" and once done, press "Back"
It will take quite a long time to boot. Eventually, it will be "updating Android"
Enter the Daddy/Momy mode and go to the Play Store to get "Root Checker" (e.G. : from free Android tools) to see if the device is rooted properly. Use e.g. : ES File Explorer (as far as you already checked all the options in Settings > Root Settings) to delete the relevant .apk files under /vendor/app/. Pay attention that if you delete all of them, you will get a blank welcome screen. If you really want that, make sure that you hat set "Parent Mode as Default Mode" in the Settings > Personal/Security. I have time to time Print Jobs stuck in the Print Queue that cannot be canceled or deleted. It's always very frustrating as it blocks other Print Jobs which are usually quite urgent... The only solution is to stop the spooler and delete its content from a command prompt. Often, it starts with a Job stuck in the Print Queue and not printing. For some reason, although I restart both the PC and the Printer, the Job never starts. So, I try to cancel it but the Job does not disappear from the Queue and keeps displaying the status "Deleting-Printing..." for ever. I think that the problem occurs when the PC goes into the Sleep state while the Print Job is not yet completed (But I am quite sure there are other causes). When the PC is waked up, the Job appears stuck for ever.